sMelanoma, cancer stinks! : Fourth Ipilimumab dose is complete! So now it's time to celebrate! Actually, the celebratory blue cupcake was at my daughters third birthday party. But it also seemed fitting for this post. My labs are still good, and at my last check up -- The doctor was again "unimpressed" with my very mild side effects. Since the third dose, I've gotten sick one time and I've got a slightly itchy-rashy spot on my back. But otherwise am in great condition, mind and spirit. Dr Spira basically congratulated me and told me that I would have seen any major side effects by now, and that I've simply sailed through the protocol. The next step will be to wait a few weeks and then have another whole body PET/CT, which is scheduled for the 10th of December. I will meet with him a few days after and determine the next step. The protocol has changed and it looks like they will mostly likely hold off on the second course of treatment. Everything depends on the outcome of my scan, but the drug company wants to also measure success after the first course of four treatments. I am prepared with my argument should we reach that point, but it all hinges on the result of the scan. I've got all the drug in me now, so now is the time to wish me luck. We need all those monoclonal antibodies to do their work and wipe out this cancer for good. From those I know doing Ipi...the "break" may be weeks before the next dose...it appears that Ipi will continue to work...side effects with Ipi is also a good thing...the more you have they are thinking the better it works!- Lynn- Stage 4 NED doing a Anti-PD 1 vaccine trial at Moffitt! WOW, Mike Brockey! Can't believe that I missed this newest update until just now! 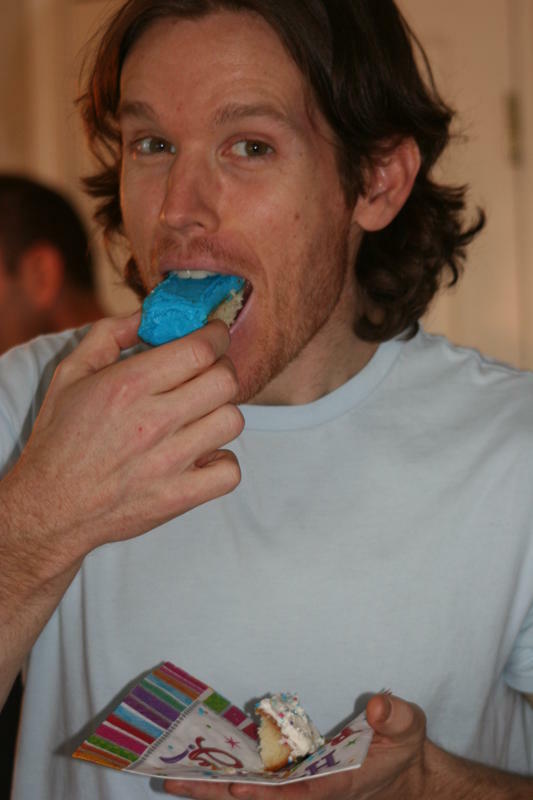 First...I LOVE the picture of you eating that blue cupcake!! Second...I LOVE the news that you have sailed through the protocol. Third...I LOVE sending good vibes your way for EXCELLENT news from the PET/CT scans. And Fourth...I LOVE the Brockey family! Hugs to you and your family! Looking forward to seeing you all sometime soon! I found your blog while looking for info on the Gerson diet. I lost my dad to melanoma many years ago, and my best friend has it now. I wish you all the best with your therapy and recovery. 1. intravenous vitamin c. my husband goes in twice a week for a 'meyer's cocktail'. some folks use this in lieu of chemo, others to help ease the symptoms of chemo. i can't recommend this highly enough! 2. Essiac Tea. this is an herbal tea that has been known to eat up tumors. i give a small cup to my husband one hour before every meal. 3. daily shots of wheat grass juice. the properties within have been shown to be great at fighting cancer. http://www.rational-t.com/ also on Facebook. They biopsy tumor cells and profile it to determine the most effective, least toxic drug/combination based on your unique tumor makeup prior to treatment. I haven't tried it, but I am considering. Just thought I would share the info. All the best on Dec. 10th Mike! Leslie ~ Just curious what dose of Vit C is your husband getting each time, and how much does it cost you? Do you know what else they are mixing with the Vit C? I was getting a high does of Vit C once a week of 100mg for 1.5 years. It is expensive, but I am going to start up again as I noticed my markers jumped since i stopped. my husband receives 75 grams of vitamin c mixed with b12 and magnesium twice a week; we'll probably go down to once a week at the beginning of the year (and no less than that after reading your comment!) it's about $125.00 per visit. yeah, it's not cheap- but what is when it comes to treating cancer? It has been awhile since I checked in, but I wanted to say hello and wish you well again. I am really interested in finding out if Ipi gets FDA approval later this month. I am holding out well. I'm still on an almost completely vegan diet, with a LOT of supplements. The two I use the most are Astragalus and AHCC. Began using AveUltra a month ago, and also have been brewing Chaga mushroom tea on a regular basis. Just had a checkup, and will have a PET scan sometime in February. Take care, Mike, and I hope you and your family have a nice Christmas. Hi Leslie and Anon, pls tell me where you go for the IV vit C shots. My mom has stage 4 urethral melanoma diagnosed in March. She had IMRT in August because she is too frail for surgery or chemo; but she collapsed half way thru IMRT, and is still fighting radiation side-effects. I've been giving her oral vit C and she seems to respond well to it. She can no longer handle any conventional treatments and looking at alternative treatments. Mike I've followed your blog for a while. I wish you all the best. And thanks for sharing your treatment history.